A weekly look at the draft selection in beer-friendly bars across the country. If your definition of summertime doesn't include barbecue, beer and baseball it's time make some serious corrections to your agenda -- like, with a bright red pen. In Detroit, those properly schooled in brews amble on over to Slows Bar BQ a joint that caters to fans of all three types of fanatic. Just a mile or so down the road from Comerica Park and in the shadow of the old Tiger Stadium, Slows is a popular pre- and post-game stop for Tigers fans. Manager Terry Perrone notes that its primary appeal is the food: "We're a barbecue restaurant first and foremost." Terry isn't stopping suds snobs with a nose for microbrews from slipping through the door, too, though. With renowned Michigan names like Bell's, Founders and New Holland, Slows has no shortage of local breweries to draw from and stocks as many as possible: of 20 taps Perrone says they try to keep "no less than 14 from Michigan or the region." Some, such as Great Lakes Grass Roots Ale and Dragonmead Corktown Red, aren't readily available anywhere else. So though Slows puts eats first, Peronne admits, "We see more and more [beer lovers] as the notoriety gets out that we are a great destination to find these local beers." Check out yesterday's complete draft list after the jump. (Got a fave on the list? Let us know what we should be sipping this summer). 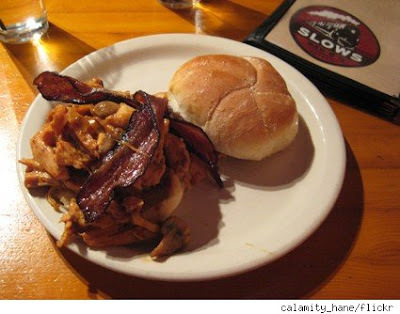 I love Slows! The Reason sandwich on Texas toast, a side of mac and cheese, and a pint of Edmund Fitzgerald. Oh, and if they tell you there's an hour and a half wait for a table -- they're exaggerating. It'll be 45 minutes. And it'll be worth it!